Healthcare providers bind patients to the facility with a modern communication channel. The exchange of information is facilitated for patients and healthcare providers. 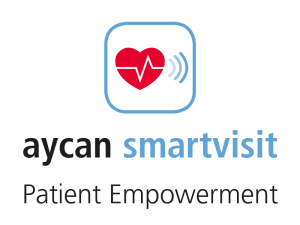 aycan smartvisit enables physicians to provide their patients with more active health management while improving patient flow—patients remain within the care network, avoid unnecessary admissions, and physician visits/contacts are optimized. 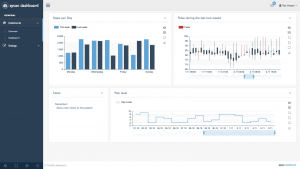 Using the aycan smartvisit dashboard, physicians set up individualized smartvisit profiles and apps for their patients to collect the data they need to monitor and prescribe continued care and treatment. On a daily basis, a patient with chronic back pain records their medication1, pain, and movement (e.g., with the help of a fitness tracker) and provides this information to their attending physician. During a patient’s admission to a hospital, they share their historical vital data with the attending physician. After a patient is discharged from the hospital, they share images of their scars with the surgeon to monitor healing progress. When the patient shares their data, its encrypted and transmitted (without storage on the Internet!) to a secure server where it’s stored and encrypted according to the latest security standards, and can only be opened via special interfaces and programs. With aycan smartvisit, patient data is secured in accordance with strict data protection laws (GDPR).